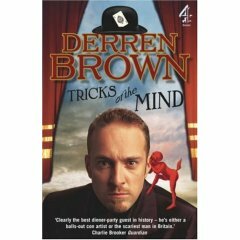 There are some very good bits in Derren Brown’s Tricks of the Mind. His previous two books Absolute Magic and Pure Effect were really great, with an enjoyable writing style and (of course) superb content. They were a lot to live up to, and his latest book isn’t as good. I saw the excellent film of this first, and immediately wanted to read the book. I hoped I could still get the same amazement from it, already knowing the secrets behind the magic from the film. It’s written very well, and it is an absolutely marvellous story.